Oh Dog! I am so excited! Today I get to interview another Alaskan Malamute! And she lives with cats too! I guess I’m not the only dog that puts up with kitties. Anyway, I know you’re going to love her story, so put your paws together for Sasha! Rumpy: Thanks for being my guest Sasha! Tell us about you. 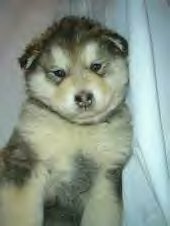 Sasha: My name is Sasha and I am a sable Alaskan Malamute. I was born in Gridley, Illinois and I live in Champaign, Illinois. I’m the only dog here now, but when I was an itty bitty puppy there was a dog here named Nikki (rescue dog from our local shelter!) who was my best friend ever. She went to the RB and I miss her. Rumpy: I’m so sorry Sasha. What makes you happy? Sasha: I LIKE TO DIG HOLES! I love squeaker toys and I howl when I make them squeak, it’s beautiful music! Squeak Squeak WOOO! Rumpy: I like them too! Sasha: I have a boyfriend on Facebook and his name is Tyler and he lives in Oklahoma and he’s so dreamy! I’m pretty big for a girl malamute at 130 pounds but I’m also cheerful! Nothing gets me down! I prefer to play with papa because I like to play rough (I am too strong for mama!) but I am a mama’s girl in all other ways, I go to her for noms and lovings! I am 7 years old! Rumpy: We’re close to the same age! I’m 8 years old. So how’d you come to live with your family? 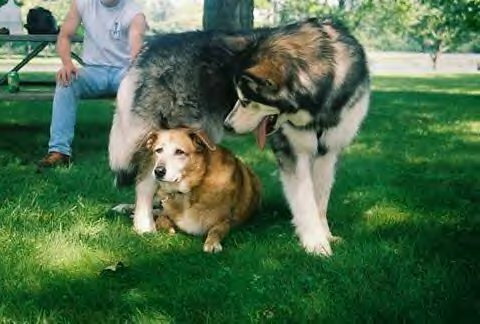 Sasha: Back in the mid-1990’s mama and papa had another Alaskan Malamute named Cody. He was their joy. He developed epilepsy and the frequency of his seizures soon became daily, to multiple times daily, despite medical treatment. His anti-seizure meds also overwhelmed his kidneys and liver =( He never made it to even 2 years old. Sasha: My folks were crushed. It took them over ten years to get another one. When they decided to get one….they searched and searched for a reputable, well-recommended place…and found one right here in Illinois! 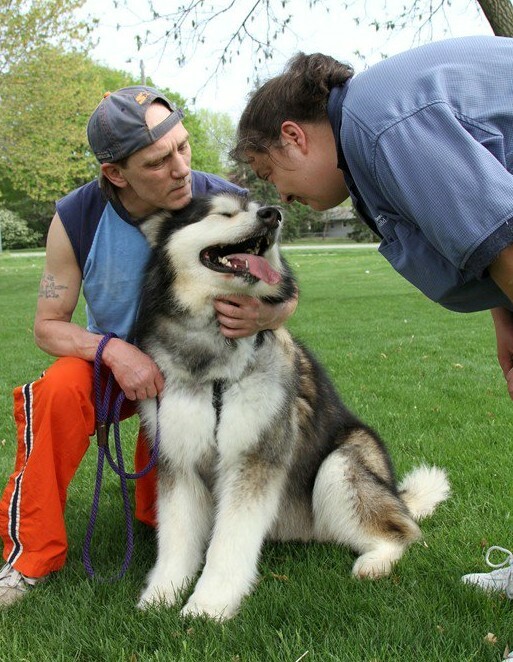 We found a family in Gridley, Illinois that has beautiful malamutes and they travel with all over the country because they are in pulling competitions. (In fact my blood-related uncle was the national champion for a number of years!) My folks were interviewed and were allowed to select a puppy (ME!) and are still in touch with them after all these years. Mama sends them notes and photos! Rumpy: So who all do you live with? Sasha: I live with my (human) mom and dad and 14 cats! I was raised up with the kitties so we’re all good. In fact, a couple of them I really really like a lot and I will groom them and let them groom me. A couple of them don’t like me, can’t imagine why! Rumpy: Whoa! Someone who has it worse than me! So tell us, if you was a dinosaur, what kind would you be? Sasha: Hmmmm. That’s a tough one. I would say T-Rex, but you know, I’m really not THAT fierce! I smile too much. In all truth, I’m a bit of a chicken…I bark all brave…BEHIND my folks BOL! I’d have to say perhaps an Apatosaurus because some of the artist renditions I’ve seen—they are very pretty and I am pretty. I am not very modest BOL! Rumpy: An excellent choice! Thanks so much for being my guest today! You can find Sasha on Facebook, Twitter @Sasha_Malamute, and Myspace. Sasha also has a Facebook fan page! Check her out! « Happy Easter from DeDe! Sasha is beautiful but that is very sad about Cody! Awwww lovely to meet you Sasha!! you are utterly gorgeous and we love that you live with FOURTEEN CATS! How pawsome!! We are in AWE!! Wow!!! Talk about beauty, Sasha is gorgeous and huge! Sasha is gorgeous! Great interview! OMD 14 cats? I thought I had it bad living with ONE! Thanks for introducing us to Sasha! It’s nice to meet you Sasha. Lovely to meet another gorgeous Malamute and I enjoyed the article about Sasha. Loup, our Mallie is all excited to hear about Sasha, too. And she likes cats just like you do, Rumpy. What’s up with that? Loup sure doesn’t, well, except for dinner maybe. Yeah well……. he is Loup, after all! woo woo! Nice interview…and she is sure a fluffy one! I bet she loves the snow in Illinois! hi sasha…great interview. 14 cats your one lucky dog. Aaah, Rumpy, Sash is a gorgeous girl. She certainly seems to be a very happy dog. Sasha, you have such a beautiful coat and you look so huggable! Hi Sasha!!! *waving* What a cheerful and gorgeous girl you are! I like the way you see things so happily! That makes us who read your interview also cheerful, too! You’re very lucky to have wonderful and lovely Papa and Mama! Great article, we know Sasha from Myspace BOL!! 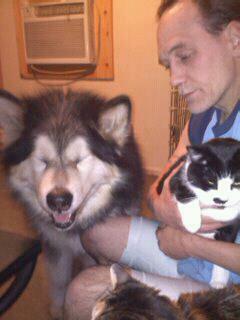 I’m so happy Sasha has a forever home that also loves so many kitties, WOW 14, what a crew! Great interview Rumpy! It was nice to see you stop by today. 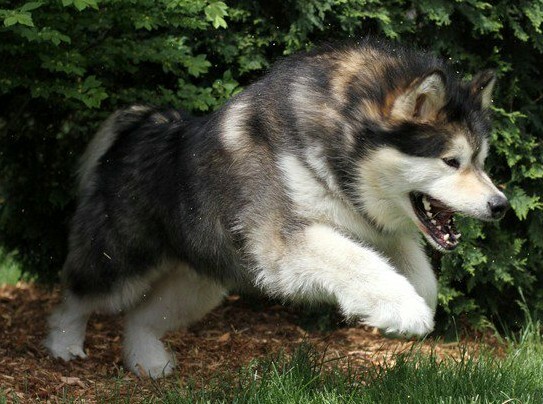 What a gorgeous Malamute!!! Sasha is a cutie – and very brave. If I lived with 14 kitties, I might hide under the bed a lot. Oh Cupcake, want me to send June Buggie over to help you with your fear of cats? What a great interview Rumpy! How cool to meet another Malamute. Sad that Cody had epilepsy 😦 But glad Sasha’s parents decided to get Sasha! And wow – 14 cats! Shasha is one pretty babe! Wooo Woo! Thanks for the interview. Hi! Rumpy you did such a fabulous job interviewing our Sasha, thank you for the opportunity to share her with everyone! We love your blog! My beautiful Sasha!! Great interview my love!!! Great subject Rumpy, we love reading your blog!! Nice to meet you, Sasha. Sahsha is a big girl and she is super cute! Thanks for introducing us to here Rumpy! We loves your jumping picture at the top and your puppy picture! You is adorable!! Tyler is a lucky boy! Sasha, you are gorgeous! And, psssssst, we think you make a cute couple with Rumpy. Hey an older guy is a good thing. Wag wag, Max & Bella. 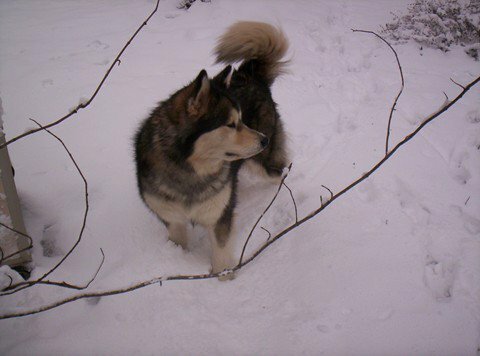 Malamutes are gentle giants – lovers of humans and cats and other critters:) I knew two growing up that were show dogs and sled dogs; Whiskey (male) and Brandi (female) – loved to play and always open for a great belly rub or brushing.